This is an example of a trade that will take 1-2 months to mature. 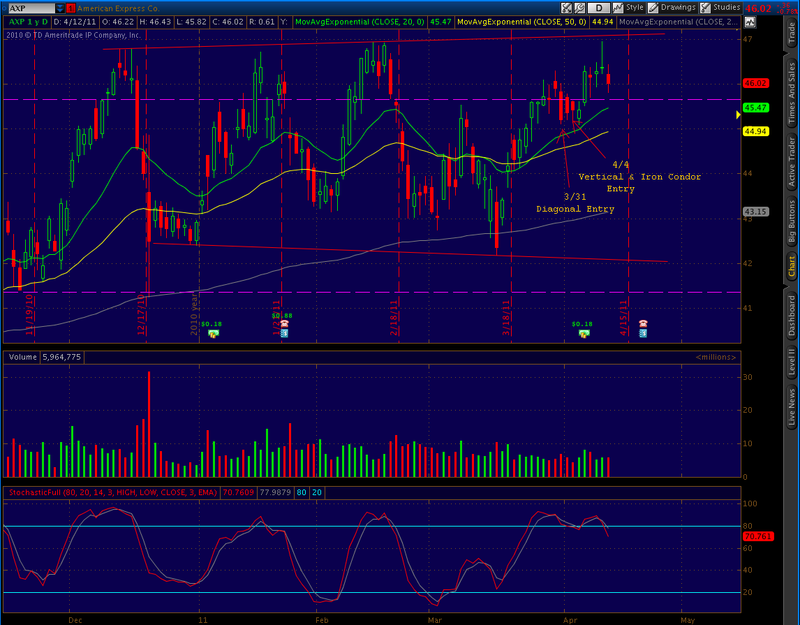 I began building a position in AXP (with downside bias) on 3/31/11 and it started reversing sharply upward on 4/5 [chart]. By developing a strategy and updating it as circumstances changed, the basis of the underlying MAY short position was lowered and risk was hedged away with an emphasis on efficient use of capital. The overall position in American Express Co. is now positive even though it moved in the opposite direction from what was originally anticipated. The goal of the entry process was to build a position by layering high probability spreads on top of each other which created an inventory of goods for sale that could be reconfigured to create something valuable. An emphasis on keeping both risk and capital requirements minimal was prioritized at each level of the trade. The current inventory of the position can be reconfigured various ways but the simplest way to present it is integrated to stock simultaneously short 300 shares and long 200 shares with a reduced basis in the long MAY PUT. The speculative position is the Long MAY PUT and the rest is the “inventory.” The inventory is hedged against itself elegantly; MAY long synthetic stock vs MAY short synthetic stock and APR short synthetic stock vs the APR 48 CALL. 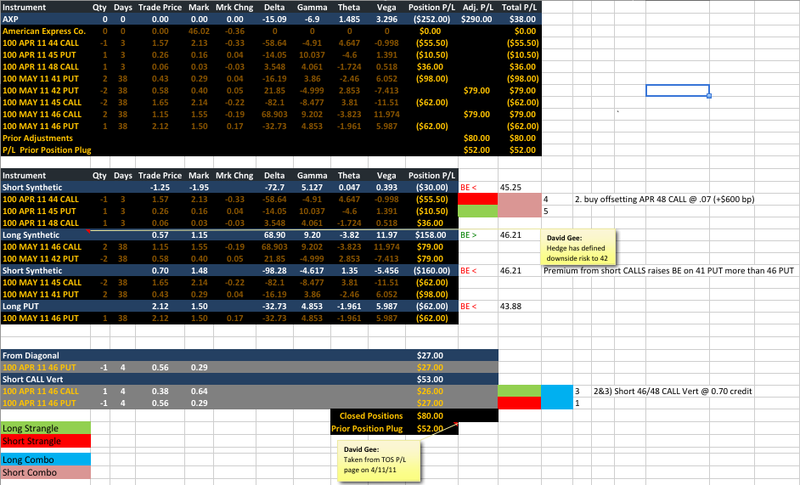 The APR 48 CALL was bought for 0.06 and reduced capital requirements by $600. Deltas are beta weighted to SPY. The trade history for the position is located in the adjustment phase link above and includes detail on how the spreads were taken apart and recombined. Enter a diagonal with an embedded long PUT vertical to take advantage of a move down. After Friday expiration the short PUT expires worthless and the basis of the long MAY 11 PUT is reduced by 0.54 to 1.58 (25% reduction in basis of PUT) which moves the break even point up, lowers the risk of the position, and frees up capital. Sell an out-of-the-money weekly PUT vertical. 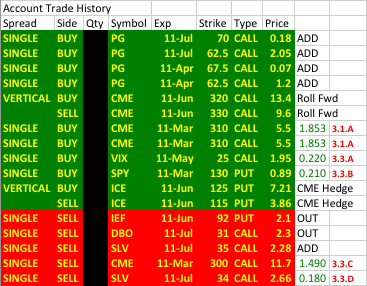 Since there is an embedded long PUT vertical in the diagonal then I could sell a PUT vertical against it to collect .07 which lowered the basis of the MAY PUT and the risk of the position while freeing up more capital. 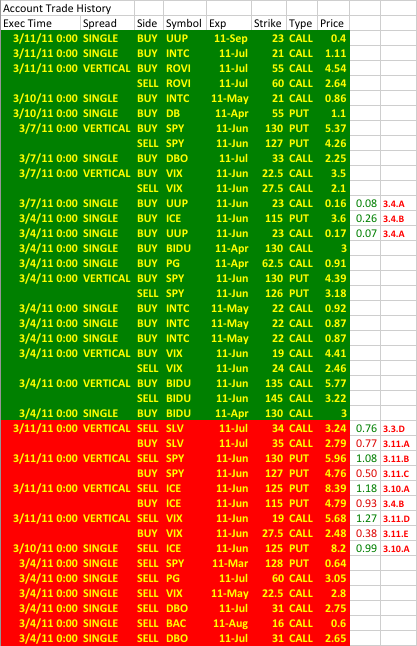 Sell an April CALL Vertical and a May Iron Condor. 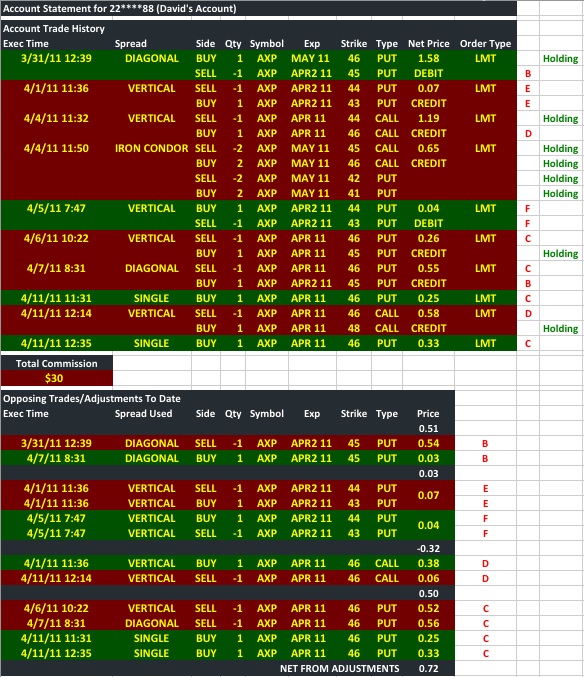 Up to this point AXP had been moving with me so I felt confident adding a similar position for April and May expiration. 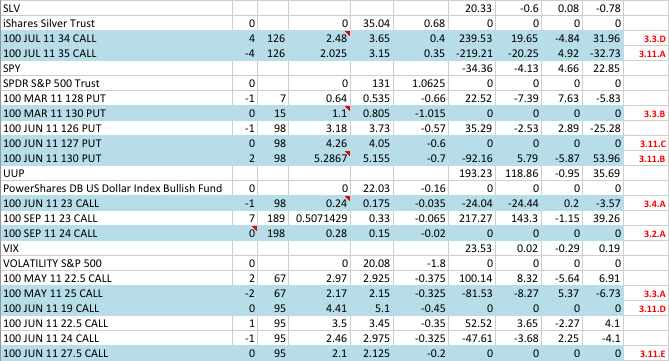 P/L from each spread already recorded in the portfolio tab will not be included retroactively.